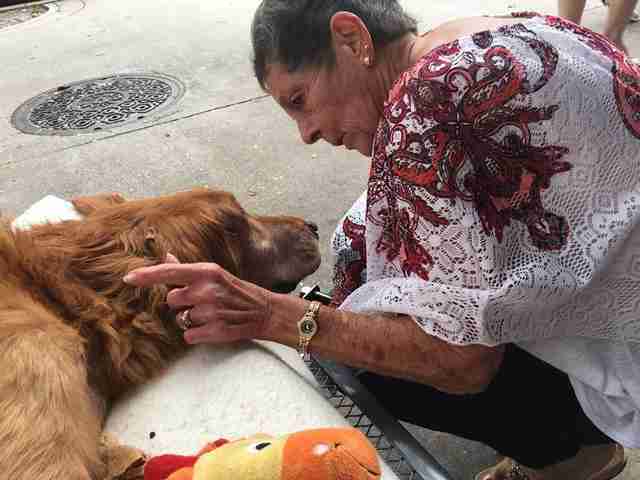 The effects of illness and age may have slowed Maverick down - but he's got love on his side, and he isn't standing still. 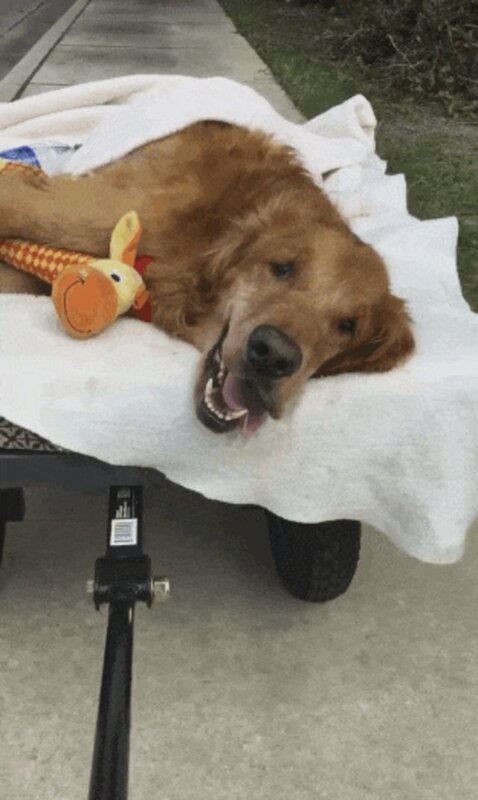 Florida resident Joey Maxwell and his wife adopted the golden retriever eight years ago from a kill shelter, where he'd been taken after his original owners abandoned him as a puppy. Upon meeting, it was clear to them that, despite Maverick's sad past, his spirit was stronger than what the world could throw at him. "He had spent about three months alone out in the woods," Maxwell told The Dodo. "When we got him, he was absolutely skin and bones, but he was perfect. 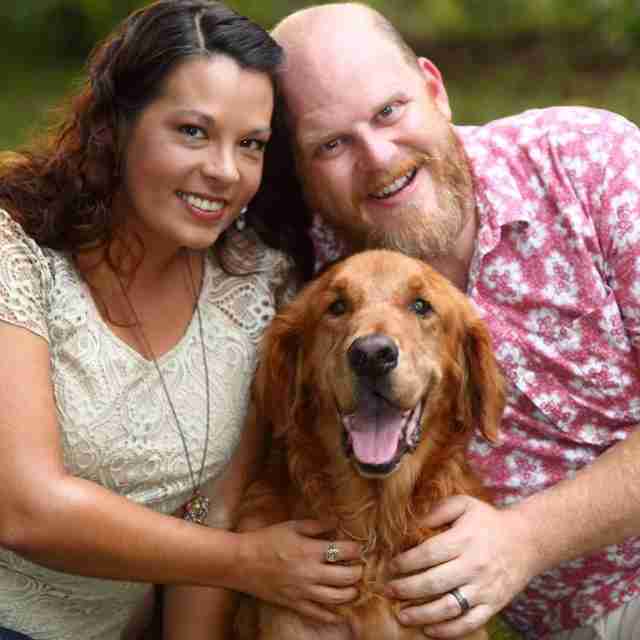 He loved us immediately, and we knew he was going to be our dog. We've had him ever since. He's been spectacular." Still, there were more challenges yet for Maverick to face in his life - only this time, he wouldn't have to face them alone. Two years ago, Maverick was diagnosed with lymphoma. 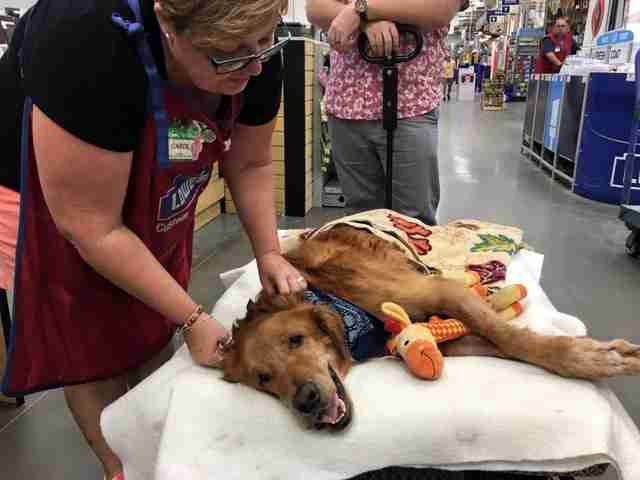 Rather than accept they would lose their dog to the disease, however, his family got him the chemotherapy treatment he needed. And before too long, the cancer was in remission, with Maverick barely missing a step. In fact, he never stopped being himself throughout, or the years that followed. Two months ago, the cancer returned. Once again, his family decided to do all they could to help him fight it. 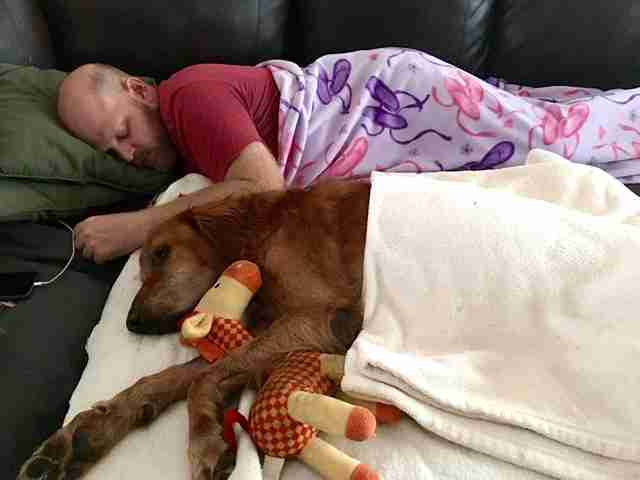 After all, he was still an otherwise healthy dog- but then something changed. "A week ago, we had a crisis. We got up in the morning and he couldn't walk," said Maxwell. "He laid there on the floor and could barely lift his head. He wouldn't eat or drink. He was shaking." 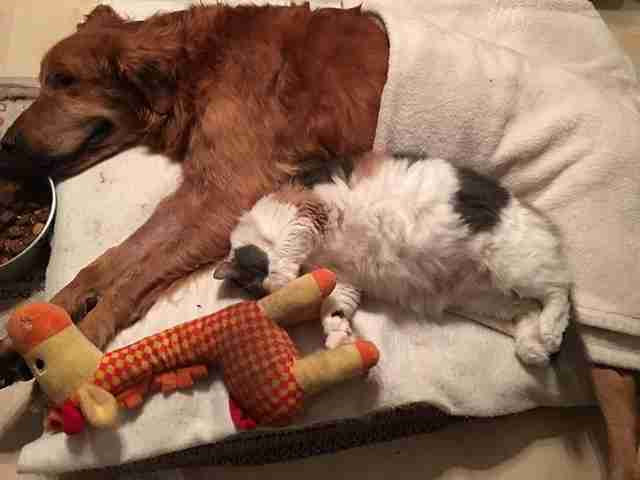 Maxwell rushed Maverick to the vet where he was found to be anemic and suffering from a low grade fever. He was kept there for a couple of days before he was allowed to return to his family. "We didn't think he was going to make it," Maxwell said. "They sent him home telling us he was pretty much done." In another sense, though, that was just the beginning. 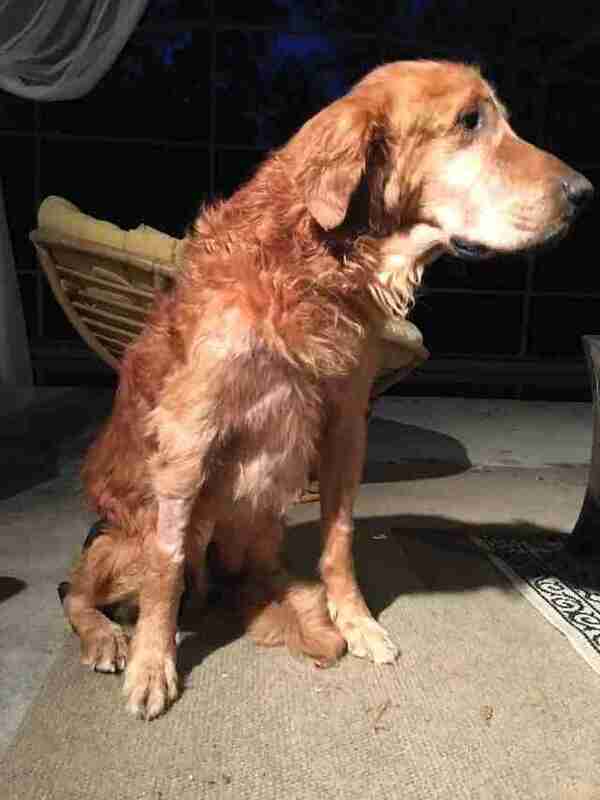 Back at home, Maverick's physical condition was still poor - but his spirit was strong. So, even though death seemed at his doorstep, there was time left for joy. "We decided, if this is it, that the last thing he feels is not depression, lying around the house with us crying over him. We wanted him to go out and do what he loves to do, and that's being outside, getting attention. 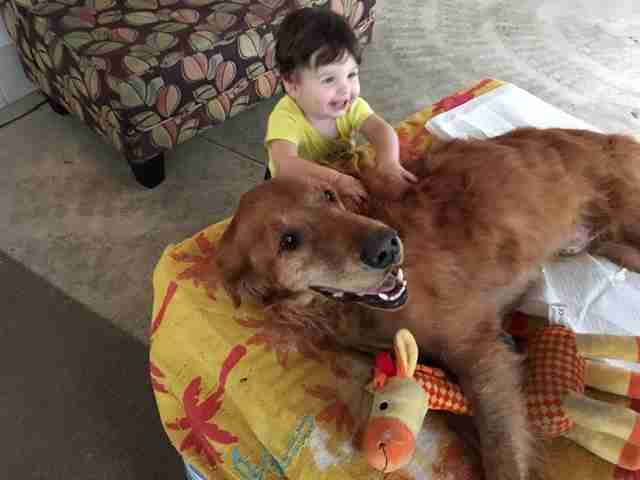 He loves being loved," said Maxwell. 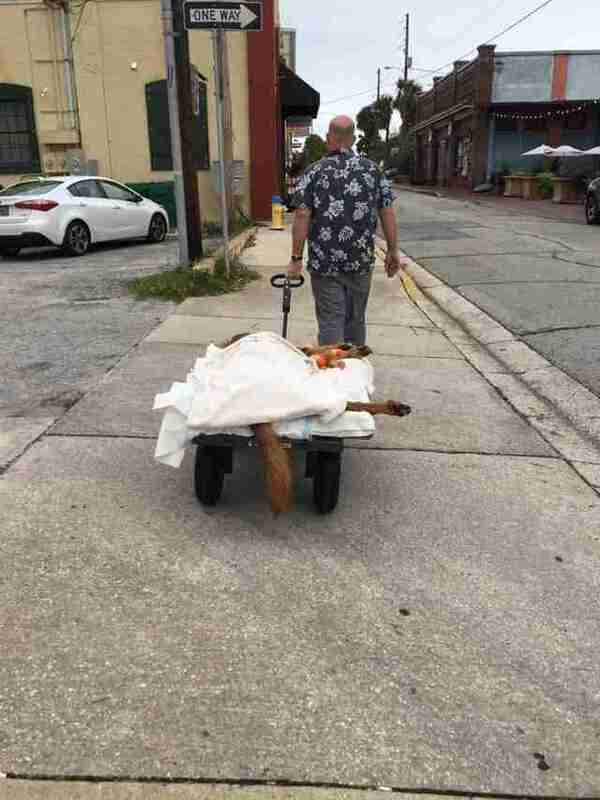 "I was determined to get this dog out of the house, to go for a walk to get a cheeseburger and some ice cream." Since Maverick couldn't walk on his own, Maxwell had the idea to purchase a wagon big enough to carry him. He took a trip to a local Lowe's hardware store. "They were sold out of wagons because we just had a hurricane here," Maxwell said. "I ran into the manager and explained my idea of Mav. He called other stores and found one within five minutes. They brought it to the store, built it for me, and sold it to me for 50 percent off. I cried, and so did the cashier." And with that, Maverick was soon back on the move. 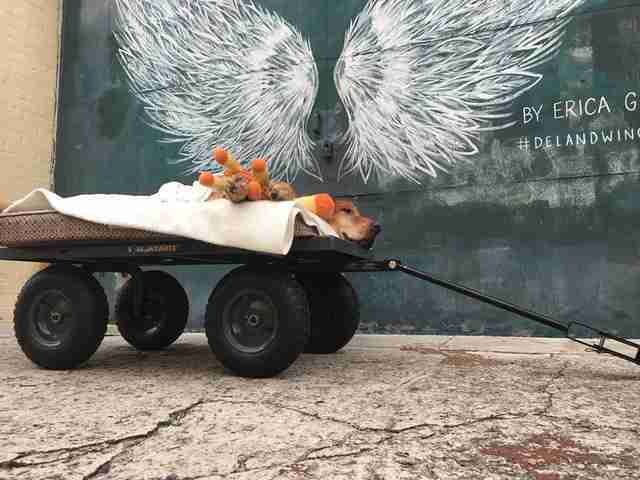 "I got home and put Mav's bed and a blanket on the wagon, loaded Mav up, and we went downtown," Maxwell said. 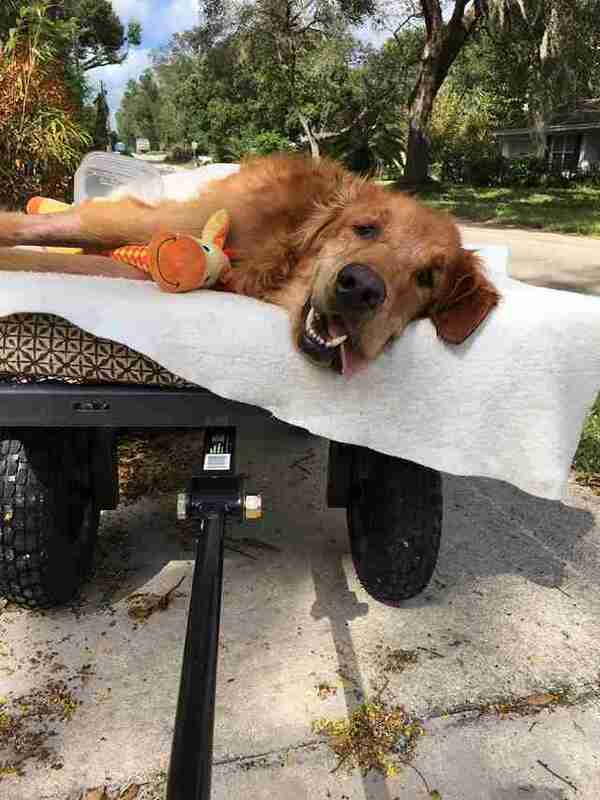 "As soon as I started rolling that cart, the second we started moving, his mouth flopped open and his tongue hung out. He lifts his head off the bed and has this big dog grin from ear to ear." Maxwell thought this might be their final walk together - but it was not. "There was an instant transformation," said Maxwell. "So the next day we did the same thing. I noticed he perked up a little more. We've taken him downtown pretty much every day since. Now people have started recognizing him and come to say hello." What was initially thought to be perhaps Maverick's final act has turned out to be his finest hour - and then some. "His health has actually gotten better," said Maxwell. 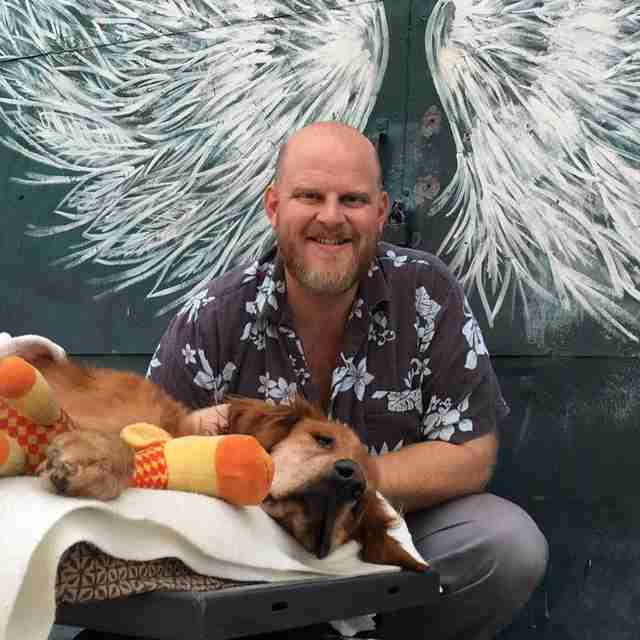 "When we first did this, we thought this was our last day or two with Maverick. Instead, it's turning into the best week. Now it could be the best two weeks. Then maybe the best month. It keeps growing, and he's still loving it." Turns out, lifting Maverick's spirit on those daily walks has done more than anyone could have imagined. The end, which once felt close at hand, was now pushed further on the horizon. Mav has even found the strength to sit up on his own. "There was comfort in knowing we could still make him happy," Maxwell said. "We fulfilled that mission, and now Maverick is fulfilling his." It's unclear how much time left Maverick has left, but thanks to his owner's dedication, he's at least back in the fight. "We visited the vet yesterday, and they determined that he's actually healthy enough now to start chemo," said Maxwell. "He's still not walking, but we are going to start thinking more long term." Maverick may never be his old self again in some ways, but in another sense, those daily walks have allowed him to be more himself than ever. "I had to find a way to get him out to be Maverick. I think it's helping. And he's become a local celebrity just doing what he loves," Maxwell said. "Mav loves everybody, and now everybody loves Mav." To follow Maverick's progress, follow this Facebook page set up on his behalf. Also, folks interested in helping cover the cost of his medical treatment can make a donation here.